The latest news from The Vermont Ski and Snowboard Museum. We will keep you up to date on all the newest Ski and Snowboard events, so check back often! STOWE, VT: (November 20, 2017)- What is it like to race on the FIS Audi World Cup against the fastest ski racers in the world? How do you hold an edge on concrete-hard ice while turning at 60 mph? Get the insider's view of racing on the FIS Alpine World Cup events around the world with Olympic and World Cup racer Jimmy Cochran, Igor Vanovac-a former member of the Yugoslav National Team and a Chief of Course for the Killington World Cup- and Tucker Marshall, (one of the upstart Redneck Racers) who is competing on the world circuit without support of the U.S. Ski Team but with a whole lot of humor. Marshall will also share some of his insightful and often hilarious videos from the Redneck's training and racing. The roundtable discussion will be moderated by Bill McCollom, a contributor to Ski Racing. 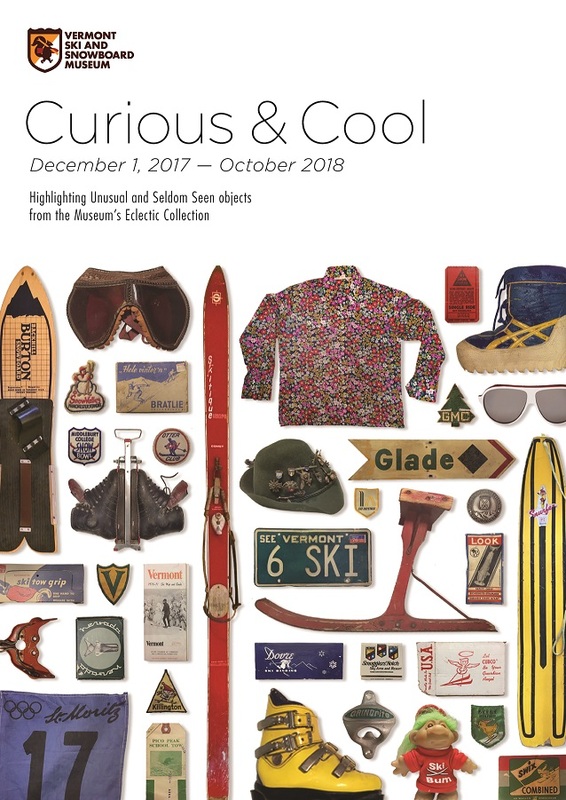 STOWE, VT (November 13, 2017)— Unusual and seldom seen objects from Vermont Ski and Snowboard Museum’s eclectic collection will be unveiled at an Opening Party for ‘Curious & Cool’, a new exhibit opening on December 1st. Hundreds of items, many never displayed before, have been selected for the ‘Curious & Cool’ exhibit being underwritten by People’s United Bank, Darn Tough and Ferro Estate & Custom Jewelers. The exhibit will run through October 2018. “Each item, serious or silly, has a unique story to tell about the evolution of skiing and riding in Vermont”, says curator Meredith Scott. “We are pulling a lot of amazing things, large and small, out of our archives and are excited to show them off”. ‘Curious & Cool’ will surprise viewers with harebrained inventions, kitschy memorabilia, technology bloopers, short-lived fashions and après ski fads. The skiing and riding community is invited to celebrate the opening of ‘Curious & Cool” on Friday, December 1st from 7:00pm to 9:00pm. Raffle tickets will be sold for a chance to win a Stowe Mountain Zip Line Tour including lunch for two and Darn Tough socks. A cash bar will be stocked with craft beer from Collective Arts Brewing, warm Hetta glogg, and non-alcoholic beverages. Donations at the door are appreciated. Vermont Ski and Snowboard Museum, located at 1 South Main Street in Stowe, VT, has been interpreting and sharing Vermont’s ski and snowboard history for 15 years at its Stowe location. The Vermont Ski and Snowboard Museum has kicked off the 2017-18 Membership Drive! 2 for 1 Lift Ticket at Stratton, Jay Peak, Pico, Burke, Killington, Bromley(Sunday-Friday), and Mount Snow Ski Resorts. 27-42% Off Multi-Day tickets at Okemo. 2 for 1 Vermont Travel Cards. Cards allow deals on lift tickets to 12 mountains and on restaurants, lodging and more! 2 for 1 Trail Fee and Rental Equipment at Trapp Family XC Center, Stowe; and Grafton Ponds Outdoor Center, Grafton. 2 for 1 18-Holes of Golf at Jay Peak, Stratton, Mount Snow, and Killington Golf Courses. Stay 2 Nights. Get 3rd Night Free at Trapp Family Lodge, Stowe. 20% off Killington Grand Summit Hotel and all Village Lodging Properties. 20% off Purchase of $100 or More at Pinnacle Ski & Sports, Stowe; Vermont Trailwear, Waterbury, VT; and 3 Equipe Sport/Mountain Riders Shops in Southern Vt. While most of the coupons are not good during Holiday periods, this year most of our alpine skiing coupons are accepted on Saturdays! Just use ONE of the skiing or golf coupons and you will have paid for your membership! Visit our Support page to Become a Member! The who’s who of the ski and snowboarding world will gather at the Stoweflake Mountain Resort in Stowe on Oct. 21 for a dinner and silent auction to celebrate the 2017 Vermont Ski and Snowboard Museum Hall of Fame inductees. The Vermont Ski and Snowboard Hall of Fame will also announce and present a new First Tracks Award this year. This year’s Hall of Fame inductees are Williston native Ann Battelle, a world champion mogul skier; Waitsfield’s Dickie Hall, the godfather of telemark skiing in the U.S.; Underhill’s Jim Fredericks, the man who set in place some of Vermont’s strongest Nordic programs; and Chuck and Jann Perkins of Burlington and Stowe. The Perkins founded Burlington’s Alpine Shop and have been integral in both creating and preserving ski culture and history in Vermont. The Paul Robbins award for journalism is going to legendary Vermont photographer and author, Peter Miller, of Waterbury/Colbyville. Peter Graves, a former Hall of Fame inductee and an announcer for many Olympic events, will be the master of ceremonies. “This year, for the first time, we are also handing out the First Tracks Award, to honor exceptional and ongoing contributions to the sport in Vermont by someone under 35,” says co-chair Greg Morrill. The First Tracks Award will be given in memory of Ian Graddock, a Vermont Ski and Snowboard Museum board member, lifelong skier and ski racer, who passed away in 2016 at age 35. In its inaugural year, the First Tracks Award goes to snowboarder Kevin Pearce, who was on a trajectory to snowboard in the 2010 Olympics when he crashed and suffered a traumatic brain injury. Since then, he’s gone on to set up the Love Your Brain Foundation to help others with TBIs. Since 2002, the Vermont Ski and Snowboard Hall of Fame has recognized more than 60 people who have made history in snowsports in our state. The purpose of the Hall of Fame is to honor athletes, special contributors, and pioneers of Vermont skiing an snowboarding who promoted and/or contributed to the sport of skiing and riding in Vermont; to document the histories of Inductees in the Museum's collection; and to recognize their accomplishments through the Induction ceremony and the Hall of Fame exhibit. The Hall of Fame committee looks at candidates in three categories: Athletes, Pioneers, and Special Contributors. The 2017 Hall of Fame dinner and films are sponsored by: Rossignol, Sisler Builders, and VT Ski + Ride Magazine, NJoy Events, The Violettes, Stowe Reporter and Xpress Print and Copy. Sponsorships are still available. The event at the Stoweflake Resort in Stowe on Oct. 21 is open to the public and usually sells out. Tickets are $90 and are available at www.vtssm.org/events. The Vermont Ski and Snowboard Museum is a welcome home for alpine, Nordic, and snowboard enthusiasts in the landmark ‘Old Town Hall’ of Stowe, Vermont. In fulfilling its mission of collecting, preserving and celebrating Vermont’s skiing and snowboarding history, the Museum has assembled the definitive collection of Vermont skiing and snowboard artifacts and memorabilia. It has produced videos and films honoring Vermont athletes and pioneers as Hall of Fame inductees. The Museum implements numerous exciting and memorable programs each year, including exhibit grand openings, exclusive speakers and collection showings, film festivals and much more. It is a key asset and attraction to Vermont and the Town of Stowe. Growing up in Williston, Ann Battelle would get dropped off at Cochran’s ski hill with her school’s Friday afternoon program and at Bolton Valley every weekend. One day she went to Whiteface to see a World Cup mogul event. As she describes it: “Solid ice bumps down the steep Wilderness trail. I had found my calling.” After graduating from Middlebury College, moved to Steamboat, Colo. and by her second season competing made the U.S. National Team. Battelle went on to ski on the U.S. Freestyle team for 11 years. She was a two-time World Cup champion, won the World Championships in 1999 and competed in four Olympics. She retired after the 2002 Games. When Jim Fredericks first learned to Nordic ski at Johnson State College, he went on to become one of the East’s top racers. He coached at his alma mater and then, in 1978, started the Craftsbury Nordic Ski Center program and grew it into a hotbed where Olympic-level athletes now train and compete. After Craftsbury, Fredericks launched the Nordic program at Green Mountain Valley School, a program that turned out a number of National Junior Champions. He then went on to Rossignol, working with their Nordic products and athletes. Finally, when Rossignol moved west, Fredericks took on the role of the Catamount Trail Associations’ executive director. Under his leadership the organization grew to become one of the strongest outdoor non-profits in the state and a voice for backcountry travel. Fredericks also started The Race to the Top of Vermont. Waitsfield’s Dickie Hall, the founder and director of North American Telemark Organization from 1975-2015, introduced Telemark skiing in every ski state with his Telemark Festival Series. He also conducted a yearly schedule of workshops, camps, expeditions and guide and instructor training. “Over the years I’ve probably taught over 40,000 skiers and trained 1,000 instructors and guides worldwide.” Hall started his career on the Killington Ski Patrol in the early 1970s and became Chief Examiner and Certification Chairman for PSIA-E Nordic. In the late ’70s Hall started the annual NATO Telemark Festival at Mad River Glen and ran it for decades. “This was the world’s largest public event for telemark skiing, attracting over a thousand skiers for the weekend,” he recalls. During his career, Hall also produced five movies on telemark and backcountry skiing, consulted and trained staff for the nation’s leading outdoor schools and was an adjunct professor of ski mountaineering for the University of Alaska Wilderness studies program. Most people know Peter Miller as the author and photographer behind the stunning photo books, Vermont People, Vermont Farm Women and most recently, Vanishing Vermonters: Loss of a Rural Culture, all self-published through Silver Print Press. What they may not know is that the first of Miller’s 11 published books were ski books, The 30,000 Mile Ski Race (Dial Press, 1973), about Americans in Europe on the World Cup circuit and then The Skier’s Almanac (Nick Lyons Press and Doubleday, 1980). Miller grew up in Weston, Vt. and has always followed ski racing. From 1965 to 1988 he was a contributing editor to SKI Magazine and has visited 104 ski resorts on four continents. Miller got his start as a photographer when, as a student at the University of Toronto, he had the chance to work with the legendary portrait photographer Yousuf Karsh. Miller assisted him in 1954 as they photographed celebrities living in Europe. Miller went on to work as a reporter and writer for LIFE Magazine before moving back to Vermont in the 1960s. He set up shop next door to the Waterbury Ben & Jerry’s headquarters in Colbyville. The son of glassware giant Simon Pearce and his wife Pia. Kevin Pearce grew up snowboarding at ski areas around Vermont. By 18 he had turned pro, excelling in the halfpipe. In 2008, Pearce became the first athlete to win three medals at the X Games (and bested Shaun White in Slopestyle). That year he was also crowned overall champion of the international Swatch Ticket to Ride series. White and Pearce were the top contenders for the 2010 Olympics. Both had sponsors build them private half-pipes where they could practice. On Dec. 31, 2009 Pearce was training in a half-pipe in Utah, working on a cab double cork, when he crashed hard. He suffered a severe traumatic brain injury and was hospitalized for four months. He was, in his own words, “lucky to be alive.” Pearce’s story made headline news and a movie Crash Reel, about his injury and recovery, played at Sundance in 2014. It took Pearce nearly two years to recover enough so that he could snowboard (no air or halfpipes anymore). He’s since turned his energy to helping others. Pearce started the Love Your Brain Foundation to help others with TBI and serves as a sports ambassador for the National Down Syndrome Society (his brother David has Down Syndrome).